You may use our enter clipart on your personal, school and non profit web pages and sites. You may also use the enter animations from this page on your business pages as a visual enhancement. They may not be included in any product, service or application. Blue and black enter animation. Red and yellow enter animation. Enter in red and black with shadows. Purple and yellow enter animation. Yellow and white enter animation. Purple enter in 3D with shadows. Enter 3D in grey and purple stone. Yellow enter button with perspective. 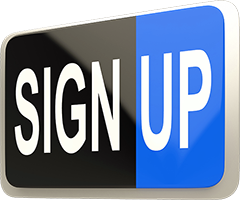 Sign Up sign with metal frame - PNG image with transparent background. Enter button blue glass with chrome trim. To use our enter clipart and animations simply provide us credit. Thank You.